I thought you might be interested in the attached photo to go with the photo of the the Queen City in Barletta in 1961. The photo was taken by my Gran, Mary Vaggers and shows my mum, Barbara Reardon Vaggers (2nd left) and Mum thinks it is Mrs Lloyd (capt's wife) and Daughter. They had travelled to Barletta to meet the ship before it set off to Australia. 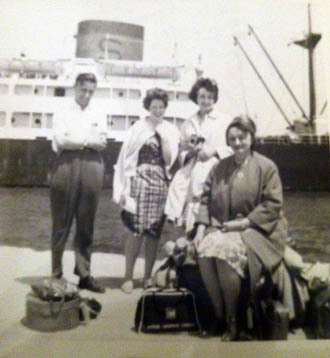 The photo shows them waiting as the ship came in. My Grandfather was the chief engineer, George Henry Reardon Vaggers. He died later that year (4/9/61) on board in Albany, Australia. I hope this is of some interest to those who visit the Reardon Smith website. I have enjoyed reading about some of the ships that my Grandfather sailed on. Kind regards, Natalie Blake. Sent by email 21 October 2013.